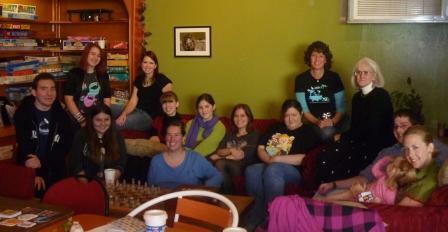 Some members of NaNoWriMo's Fairfield County, CT Region at Molten Java in Bethel for our Kick-Off Event! Our awesome ML is Charles Muir. He's all the way over on the left in the front. Many of us who participate in National Novel Writing Month seek balance between the expectations of writing, writing, writing—and all that other mundane stuff, like housework, laundry, the full-time gig, a social life, and eating. But I’ve found over the years that applying some tips I learned during NaNo are useful to me at other times of year—and can even be useful to non-writers just trying to balance their lives. ~ Clean one thing a day. Meaning, vacuum one room, scrub one toilet, dust one shelf of knick-knacks. Doing just one small thing a day will either get you stoked to do more than that—or will just help you feel like your house is under control until you do have the time to clean. You’re less likely to feel overwhelmed. ~ Give yourself fifteen minutes a day to do whatever you want. Playing your fave Facebook game, calling an old friend, watching a couple of stupid things on YouTube, reading five pages of that book you keep meaning to get to. You’ll feel like you always have recreation in your life. And don’t say ‘I don’t have fifteen minutes.’ You do. ~ Stock up. Don’t buy one tube of toothpaste because you’re out. Go buy TWO. When you start the second one, you have PLENTY of time to remember to put it on your list before you get to the bottom of your second tube. In short: buy two of each product next time you run out. This saves so much stress I can’t believe it. ~ Safety pin your socks. I’m totally serious. If you safety pin each sock to its mate, you’ll never lose a sock again in the washer/dryer. When you take them off at night, re-safety pin them together before you put them in the hamper. I haven’t lost a sock in eight years since I started doing this. How does this aid your life? Well, you won’t run out of socks so often unless they get so warn out you have to throw them away. Saves time-saves money. Posted on November 7, 2010, in Deep Thoughts & Fun Stuff and tagged Life Improvement, National Novel Writing Month, Stress Management, Writing. Bookmark the permalink. 6 Comments. ~ CLEAN ONE THING A DAY. I’ve found cleaning my palate with a goblet of whiskey usually improves my outlook, and the dog seems calmer. Not to mention my wife. After the second goblet, to make sure the first is working, I feel quite underwhelmed. ~ GIVE YOURSELF 15 MINUTES A DAY TO DO WHATEVER YOU WANT. This is most important. You can rob a bank in 15 minutes. Making love can be reduced to three minutes, leaving you open for—what?—five lovers? And you can search for your 15 minutes of fame. ~ STOCK UP. I love pancakes. Buy pancakes at every chance. You like pancakes? C’mon to my house. I got five rooms full of pancakes! ~ SAFETY PIN YOUR SOCKS. Or, if you really want to be innovative, you can staple your clothes together. I stapled a clever little sheath out of five dustcloths and a Handiewipe. ~ LIMIT YOUR TO-DO LIST TO 5 ITEMS. Oh, my God! I’m overloaded. Two whiskeys, three lovers. How will I ever get to the making a couture, let alone write the goddam novel! Back to the bottle of whiskey. Walt, you are HYSTERICAL! 🙂 Leave it to you to put a great spin on it! I loved these commonsense tips– they are so helpful! Thanks for posting them. The one about the socks is a hoot and I will be trying it for sure. We all strive to achieve a life of balance. In today’s technological world, where so much of what we do involves interfacing with computers, I would add one more tip–take a moment to connect with the earth and the real world. Stepping outside for a few minutes and a few deep breaths can make all the difference in a hectic day. Note to Walt–three minutes–really? With those stats the search for auxiliary lovers may take up most of your spare time. Melissa, you are so right. Taking time out to “smell the roses” is definitely something we all forget, and that’s such important part of balance. I always feel better when I take a moment to step outside.